Photography books can take on many different forms. They can be a collection of images from various photographers exploring a single subject, many forgettable coffee table books have been done in this manner, or they can be a single photographers exploration into a single project, or they can be a sample of a photographers work, spanning multiple themes. 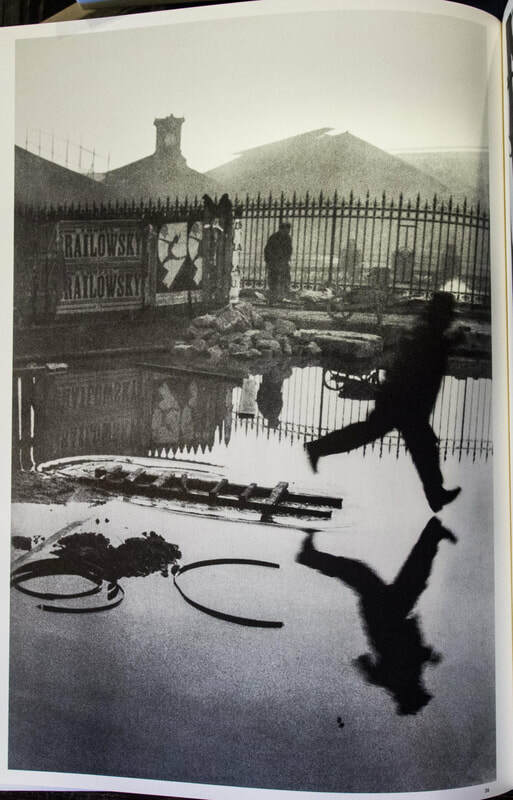 Then there is the Decisive Moment by Henri Cartier-Bresson. I have a copy of the second re-print of this book done by Steidl and it is amazing in quality. It comes in a cover with the book and a booklet which explains the making of the book. As you read through this booklet, you realize that the success of this book was accomplished by several very insightful individuals. The cover art by Matisse, the title by his French and American publisher and obviously the photographs by HCB himself. The book is divided into two roughly equal sections roughly based on chronology with 1947 being the dividing year between the two. This happens to be the year Magnum was founded, and is when HCB decided to devote himself to reportage. I view the book a bit differently and do not see the importance of the timeline of when the photographs were taken. I see the locations, and more precisely the cultures the photographs cover as the determining element for the layout. The pictures follow themes and are linked together however the cultural element of the people he is photographing seems to be the central link of the photographs. 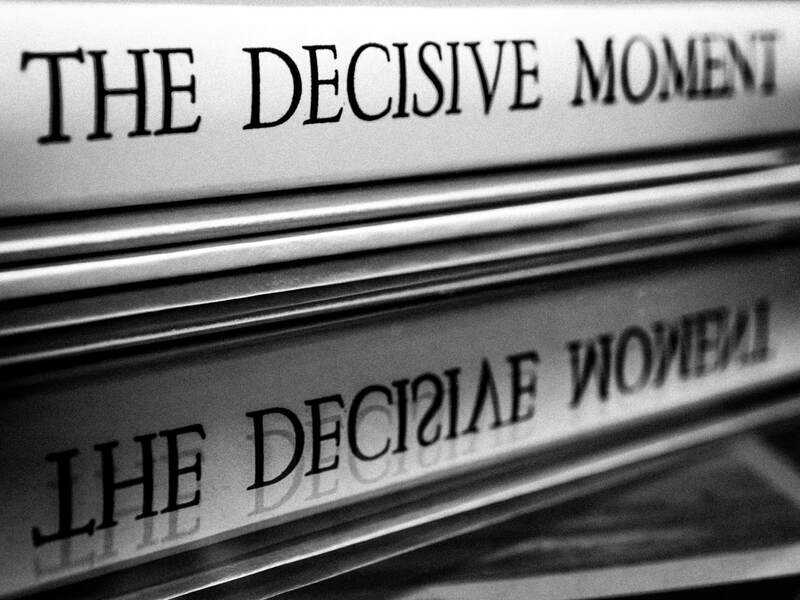 So much is spoken about the phrase or philosophy of "The Decisive Moment" that a great deal is forgotten or lost. HCB first choice for a title of this book was "A pas de loup" or "Tiptoeing" which I believe better captures his photographic style. The "Decisive Moment" while poetically simple, is not present in all of his photographs. It is indeed wonderful when all the elements and tension of an unfolding scene come together with the photographer and is captured in the perfect moment, not all of HCB photographs exhibit this quality. To "tiptoe" through a scene and position yourself such that all the important elements find their natural compositional resting place is indeed the definition of HCB work. He believed that the photographer should not interfere but should float around to find the most powerful way of expressing the scene. 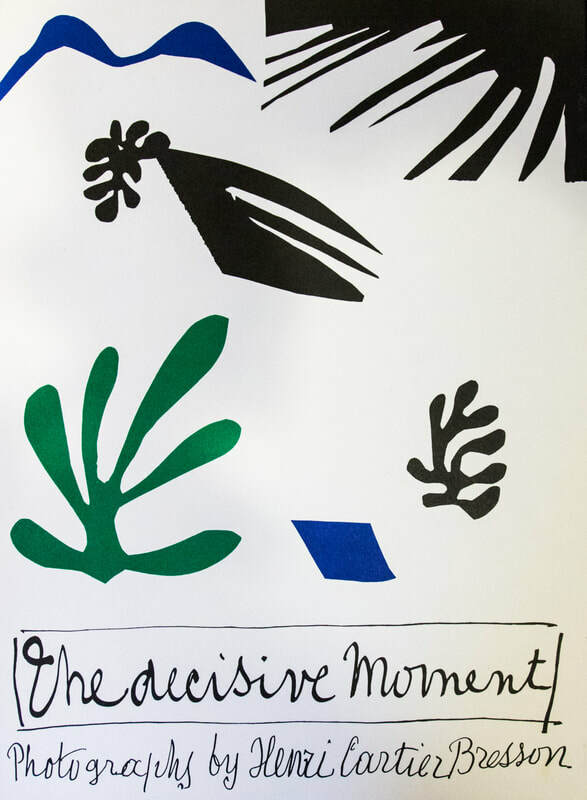 The most famous image that helps define 'The Decisive Moment' is included in a half page spread. A man jumping from a ladder which is laying on the ground, captured the moment before his foot hits the water. In the background a railway depot, a man looking through an iron fence with adverts stuck to the wall. Look closely at the adverts and you see a man jumping just to the right of the bold typeset writing. The sky is grey and lifeless and the rubble in the middle ground gives a sense of urban decay. The circular tubes in the foreground give us an indication of the depth of the water, the man will stand with his feet wet in the dirty puddle. All the tension of the scene, perfectly captured, leaving us to imagine for ourselves how the release of the tension would transform the world. When you look at this image, the title selected or influenced by the publishers, makes complete sense. How can you not sit and marvel at HCB ability to see the environment, compose the shot and wait for the tension to build before snapping the shutter. Did he shoot images before and after the build up of tension? Perhaps, he was never one to show his proof sheet, but who cares. The moment is a perfect one and I cannot imagine a better image captured of this scene. But looking through other images in his book, many are not the buildup of tension, but relaxed portraits of people and scenes where the photographer has not been noticed. Images capturing a world we do not know and are introduced to through an unseen eye. In this image HCB captures a crowd of people, gathered to see this Cardinal who is the central theme of why all are gathered. But HCB does not focus on the Cardinal because it is not the man he is interested in. He frames the scene tightly, people everywhere but only one is critical. Only one person in that crowd of people has the gesture he is trying to capture. The reason for the gesture is unimportant, the surrounding is unimportant the only thing that HCB sees, and forces us to see, is a gesture of adoration captured in the woman's face. 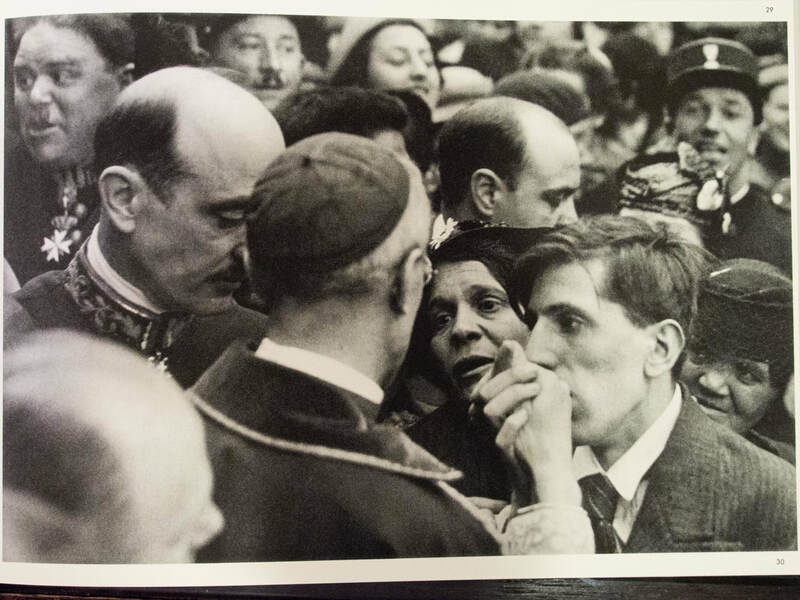 Even a man in the foreground, kissing the Cardinal's hand is merely a framing element to the one singular gesture. You can see the focus is dead on her eyes, here mouth slightly open as if in awe. The eyes are wise and pleading. There is. no innocence in these eyes, they have seen the world and are looking for respite. 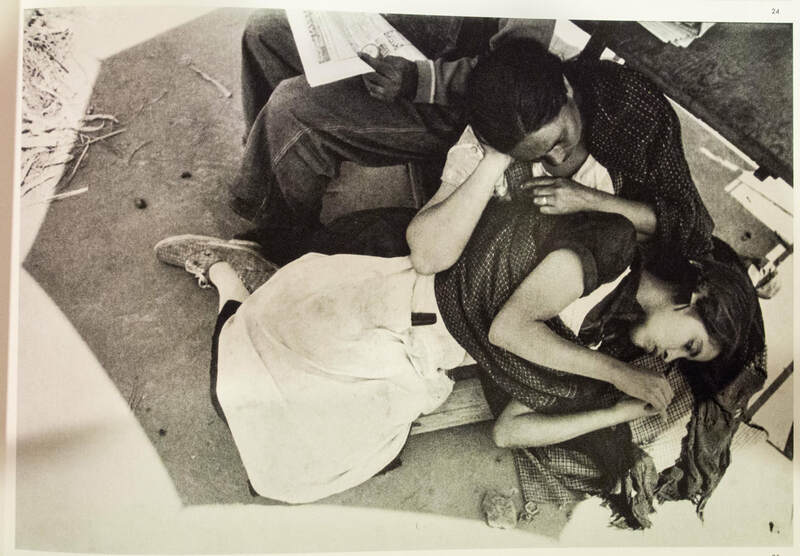 In this next image of a young woman resting there is no tension, no build up, no crowds. All we have here is a cultural gesture which is dictated by the sun. The hot, unforgiving sun of Central America where our three subjects hide from while resting. For those who have spent time in Central American towns, this scene is as cultural as a Fourth of July Parade for the United States. It is near noon, the sun is scalding and nothing can be done under it's relentless heat. The only option is to find a spot of shade and wait out the worst of its blaze. The scene is framed brilliantly with the shadow of the umbrella, the composition is balanced with three subjects and the point of focus is clearly understood to be the young girl, not asleep but focused on her hands. The images selected are classic HCB, although not all of his most well known images are included. The images were selected by HCB and he picked them based on the message he wanted to send. He did not bend to popularity but rather told his story through his images. 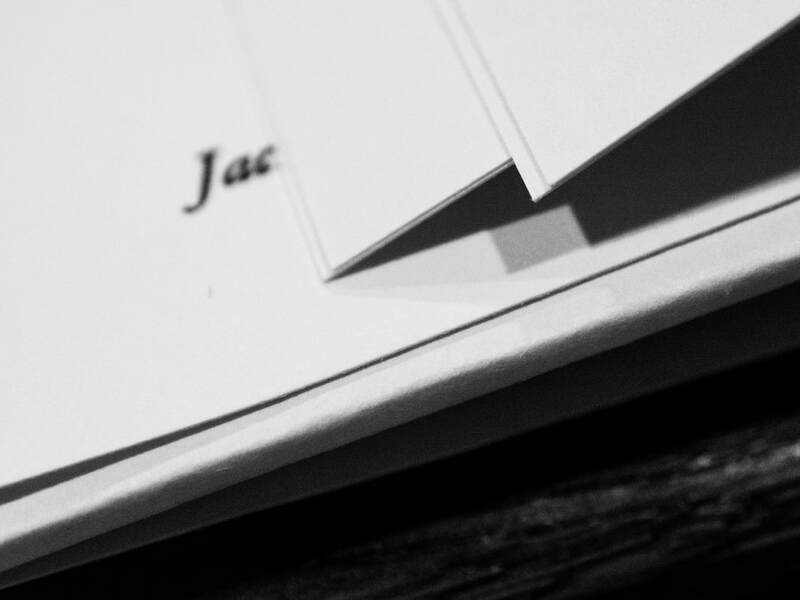 The book is brilliantly made with thick paper of a wonderful, warm tonality. It gives the images a softer feel than a harsh white would give. The blacks are printed beautifully and each page feels substantial. The smell from the printing process is unique and alluring. It is as if by opening the book you are entering a different world, and older world. That world is mixed with pre-war innocence and post war heartache. 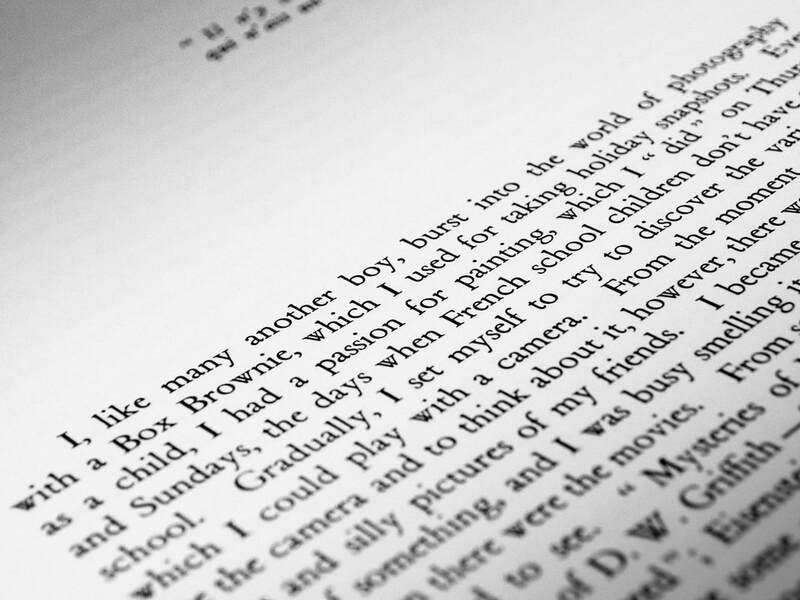 The text, all focused at the beginning of the book, was written by HCB explaining how he fell in love with photography. It is well written with large text making it easy to read. His purpose was not a book filled with wording, something his publishers had to push him to include, he wanted a book of his photographs. What it's legacy was going to be to other photographers and the importance future generations would put on his words were not important for him. His legacy are his images and this is what he wanted to capture. Well written books, filled with eloquent prose is easy to find. But to find a photography book, which transcends genre and time is very rare indeed. What I love of his writing is that he links his passion with his upbringing, his exposure to a simple camera and complex compositional scenes in silent movies. He simply describes the birth of an artist. 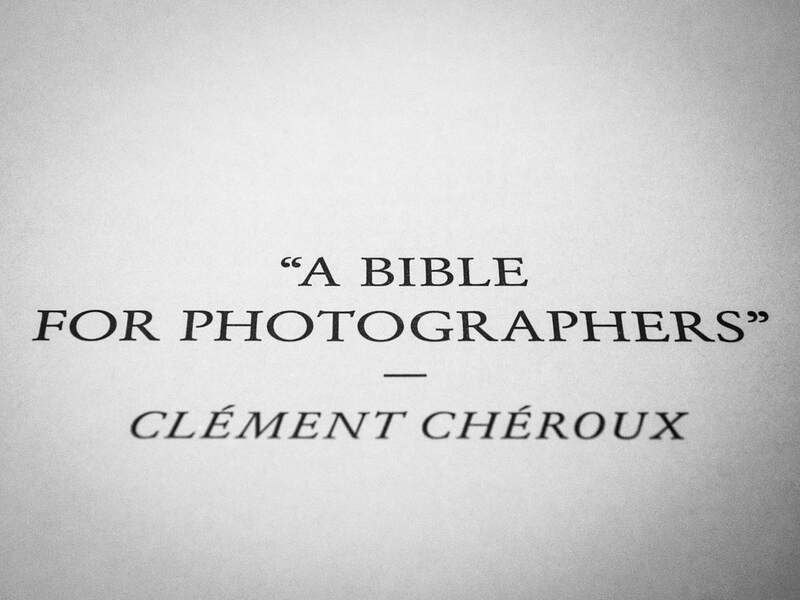 This book is one that every true photographer should try to get. They are not very expensive and it will last a lifetime if well cared for yet is a book that keeps delivering something new, every time you open it up. I do so with a bit of ceremony. On a rainy Sunday morning, I will make a cup of coffee, wash my hands and pull out this book. I will sit with natural light spilling on its pages and look, really look at the pictures. I sip my coffee, I smell the print of the book and I am transported to a land I never knew to a time I will never see. This book is filled with powerful images and the simple introduction of an amazing photographer.